You will relax and unwind the minute you walk through the door of this quality home. Enjoy the fabulous sea views and sunrises, wander across the road to the beach, or enjoy some quiet time on one of the decks. A comfortable sunny home with lovely wooden features and everything you need to enjoy your stay. Property most suitable for couples or older families. No safety barriers on stairs for babies and toddlers. Smoking only allowed outside. No pets permitted. Property not suitable for tents or loud parties - we have permanent neighbours who we respect. Our property is right across the road from the beach with only the road and a public reserve between you and the beachfront. 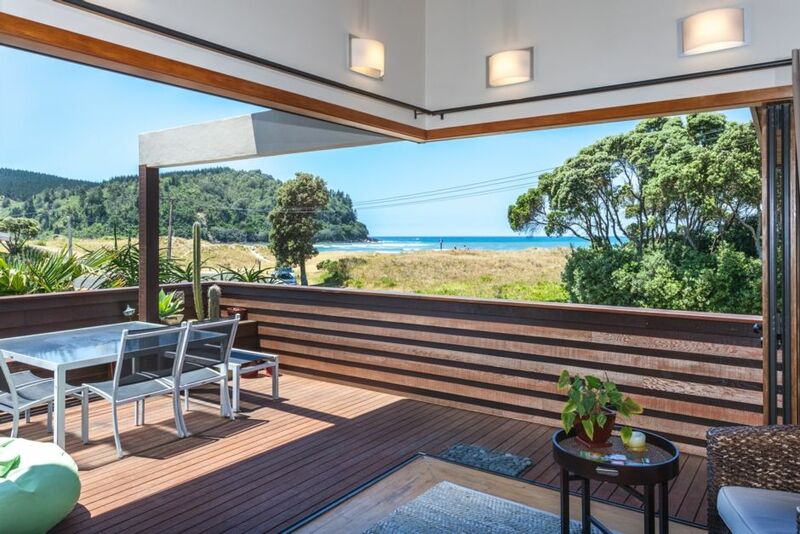 Enjoy the unobstructed view across Whangamata's famous surf bar. Modern efficient open fire with easy to use gas starter. Firewood provided. Off street parking for 3 cars to park in driveway outside garage. Nespresso coffee machine. Some pods supplied, bring extra if required. Basic pantry items supplied as back up if needed. Kitchen fully equipped with dishes and utensils. Seats 6 comfortably but can seat 8 if needed. CD player available. Own device can be blue toothed or plugged into sound bar. Comfortable, spotless, quiet, convenient, excellent space for everyone, well equipped, great for large family meals etc. This is a stunning house and location. The beach is just across the road and can be seen from the main living area and balcony. The house is beautiful and is well stocked with extras in the kitchen. It is only a few minutes walk to the shops which have numerous places to eat and drink and a very short drive to the larger supermarket. There are also places to hire bikes and kayaks just a few minutes walk away. All in all I highly recommend this house...great views, very comfortable and lots of areas both inside and out in which to relax. location Perfect, Property Perfect, a magic spot..
Communication with Catherine was great. Thank you so much for allowing us to enjoy this special spot, would love to stay again.